A View from the Touchline – BT Premier League: 25.10.14. It was a bright and breezy day on the east coast, but the west had waved goodbye to British Summer Time twenty minutes before kick-off as torrential rain swept the green meadows of Old Anniesland. Unfortunately for Currie, the elements did play a hand in this tight match which saw dominance swing from team to team. With a host of professional and EDP players on display, spectators must have been hoping for an exceptional game. Although, Currie had the advantage of an experienced, renowned and possibly match-winning centre pairing, Hawks had a similar combination in their pack, which, considering the conditions, gave their well-drilled forwards considerable momentum at critical stages in the contest. Perhaps the resulting draw was a fair reflection of proceedings, but Currie must be wondering how a ten point lead was whittled away. As the rain lashed down, some local spectators opted to view the game from behind the large windows of the clubhouse. Their comfort was soon rudely spoiled by a Currie attack. James Semple craftily chipped over the Hawks backs, the ball bounced viciously and straight into the hands of speeding Joe Reynolds; the unstoppable fullback drew his opposite number and gave John Cox, who switched on his ‘after-burners,’ the try-scoring pass; Joe Reynolds converted. Almost immediately Hawks hit back with an equally unexpected try of their own: scrum-half Paddy Boyer took a quick tap-penalty on the Currie 22, he wriggled, slithered and stepped through tackles and finally slid to the line. George Horn converted to level the scores. With the prevailing weather in their favour, the Hawks pack, under the direction of Scotland Internationalist Al Kellock, started to dominate play; they secured ball and trundled a rolling maul some 20 metres before it was stopped illegally short of the Currie line. Malcolm Peacock was shown a yellow card and the hosts went for a penalty scrum; after a series of shunts and resets in the slippery conditions, the referee awarded a penalty try. Although Currie tried to move the ball at every opportunity, the Hawks’ backs were quick to respond and stopped any advance. In the face of adverse circumstances the visitors maintained possession and made a good 40 metres into the opposition 22. A penalty lineout was turned over and cleared, but Currie kept coming back with spirited attacks. A difficult penalty attempt went tantalisingly close. This did not discourage the visitors’ battling efforts and they were finally rewarded with superb try from Chris Logan; James Downey broke through the mid-field into open space, Ross Weston carried for a further 10 metres and ‘popped’ a perfect pass to the sprinting wingman. Joe Reynolds’ conversion looked to be sailing between the posts, but a strong gust blew it off course. Halftime – Hawks 14 pts, Currie 12 pts. As the second half got under way the wind and rain started to ease. Hawks continued to play to their strengths with forward drives which Currie did well to contain. Eventually the roles were reversed and the Currie backs got into gear. The ever-improving Fideas Efthymiou ran through a number of tackles and was finally bundled into touch. The creative visitors were looking dangerous. Considering the conditions, a passage of outstanding handling now followed; Ross Weston and Travis Brooke set up the try-scoring move with some penetrating carries deep into Hawks’ territory. Richard Snedden and James Semple supplied quick ball to the Currie centres, both of whom made the most of the opportunity; James Downey passed out of the tackle to Richie Vernon who used his strength to power over the line. Joe Reynolds converted. 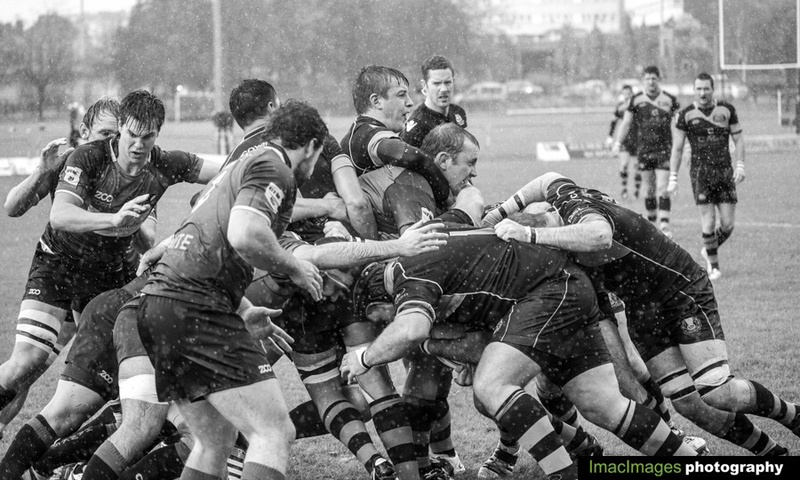 Although their scrum was still under pressure, Currie cleaned up the disruptions very well; Kevin Bryce, Mike Erskine, Graham Carson and particularly Ross Weston at the base of the scrum, all worked their socks off; it was not always easy! As the Hawks backs concentrated on the Downey/Vernon partnership, James Semple released a well-directed pass to Joe Reynolds; once again the flying fullback stormed through a gap to send Fideas Efthymiou into the right-hand corner for the bonus point try; the conversion drifted wide. With the strong wind subsiding, Hawks were now able to make ground with big kicks from the boot of Jack Steel. With good territorial gains through well-organised rolling mauls, Hawks worked towards the Currie line. That nimble former Currie playmaker, George Horn danced over for a try that he converted. When Jack Steel levelled the scores with a difficult penalty goal, the pressure really was on Currie, but the visitors kept their nerve and held out for the final minutes of the game.